I grew up in rural small town Minnesota where there isn’t a strong Jewish presence. Almost everyone knows what Christmas is and what the New Year brings. But every year, when I see Rosh Hashanah on the calendar, I wonder what is Rosh Hashanah all about. What does it mean? What is being celebrated? What are the traditions associated with it? When I started at Pear Tree, a little over a year ago, they were just kicking off their Jewish Holiday collections, which included Rosh Hashanah Cards, Hanukkah Cards and even Bar Mitzvah and Bat Mitzvah Invitations. I was instantly intrigued. I wanted to learn all about these events and what they meant to the Jewish religion. Since I had a desire to learn about the traditions of Rosh Hashanah, I thought maybe our customers would be interested as well. That’s why I offered to write this post, and share what I learned! Rosh Hashanah is the Jewish New Year. It is celebrated in Tishrei, the seventh month of the Jewish calendar. The holiday lasts for two days. In 2012 it falls on September 16 until September 18. The tradition around the holiday teaches that God decides who will live and die. During this time individuals examine their lives and repent for any wrongs they have committed during the year. Even though the tradition is around life and death, Rosh Hashanah is filled with hope for the New Year. Just as we all wish each other Happy New Year on January 1st, Jewish families greet each other on Rosh Hashanah with, ‘L’Shanah Tovah,’ which means ‘May you have a good year.’ The shofar, an instrument made from a ram’s horn, is blown 100 times during each day of Rosh Hashanah to remind people of the importance of reflection. Tashlich, meaning ‘casting off’ is a symbolic ceremony where pieces of bread are tossed into a flowing body of water to resemble the casting off of sins. Some of the main symbols of Rosh Hashanah are apples, honey and round loaves of challah. Each item has a different meaning. Apples are dipped in honey to symbolize the hope for a sweet new year. Challah, a bread usually shaped into braids, is instead baked into round loaves during Rosh Hashanah to symbolize the continuation of life. Traditionally, individuals choose to send New Year’s greeting cards. Before computers, these were typically hand written notes sent out weeks in advance. 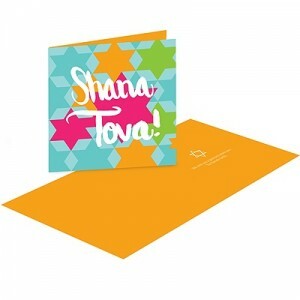 Pear Tree offers a great selection of Rosh Hashanah cards that not only celebrate the New Year but also feature symbols of the holiday. 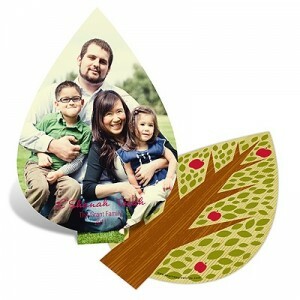 My favorite cards are the Unique Cut Rosh Hashanah Card in the shape of an apple tree, a perfect way to hope for that sweet New Year right around the corner. Another one of my favorites is the Repeating Star of David Rosh Hashanah Card with the greeting, ‘Shana Tova’ on the front. I learn more each year about the different religions and holidays that Pear Tree offers cards for, and each year I look forward to learning something new! Do you have any traditions with your family during Rosh Hashanah? Shelly recently graduated from college and even more recently accepted a full-time position as a Marketing Coordinator at Pear Tree. But she’s not exactly new to the team, having spent the prior year here as our marketing intern and Jill-of-all-trades. Shelly loves fashion, has tons of style, and as a result, was naturally drawn to Pear Tree’s unique designs. She is also an amazing baker, and it wouldn’t be a Pear Tree meeting without Shelly’s cupcakes!